Chinese zodiac Rats are considered charming, yet aggressive, shrewd with money and extremely sentimental. The Ox often tends to be persistent and stubborn but they are responsible and loyal. An ox also has an astonishing memory, and will remember everything. Both the rat and the ox are very hard working and extraordinarily family oriented. Neither the Chinese rat sign nor the ox has jealous tendencies. In fact the ox enjoys monotony and is trustworthy. The rat however can get bored and tire of the monotonous routine of the ox’s life. This can be easily avoided if the two animal signs work together. The Rat and Ox Chinese zodiac compatibility can go well, as a rat has the ability to draw the ox out of concealment and make them a little more social. Rats enjoy being social and love to be the center of attention. The ox doesn’t mind this and actually finds it an endearing quality in the rat. When the rat and the ox come together as lovers, it can be amazing. The Rat and Ox astrology signs both have a constant need to shower one another in attention. Both the rat and the ox can be incredibly sexual and love to try to wear each other out, though it can’t be done. Now, if the rat happens to be a woman and the ox a man, the woman will have the ability to keep the man in line and out of trouble. Then if the rat is a male and the ox a female, the love relationship will be on the more traditional side with the woman falling in at the man’s side. While when it comes to fights rats like to nag and pick. On the other hand you have an ox, who when angered is capable of uncontrolled rage. Even though an ox has the tendency to be tranquil and tedious, once angry they become quite impulsive. The rat secretly likes this little quirk and finds it quite engaging. According to Chinese horoscope compatibility, never before has there been a more unlikely pair of people in a relationship. When a rat and ox come together though, it can be a perfect mismatch. While you have rat whom tends to be social and outgoing, you have an ox who tends to be more shy and observant. This Rat Ox love compatibility can actually help to stabilize the rat. As long as the ox and rat feel secure, this love match will last a very long time. Another great thing about this pair is their love of family. They both adore their families and are exceptionally loyal to those close to them. This makes the rat and ox compatibility to last even longer. An important thing for the ox to remember is that the rat can get bored and frustrated with a too monotonous lifestyle. Once they find their soul mate though, the rat does have the ability to fall into monotony almost without realization. From a business aspect, the Chinese love match between the ox and rat is highly compatible as well. The shrewd mind of the rat and the strong backbone of the ox have the power to make a very profitable and successful partnership. Even in a business relationship the rat’s outgoing, social personality shines and benefits this union. All the while the ox can remain the strong, silent, backbone here especially when it comes to keeping the rat from making irrational money decisions where the business is concerned. 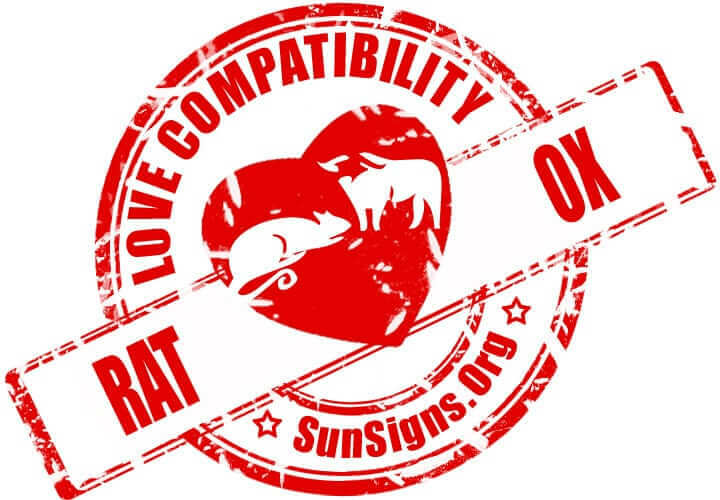 Rat & Ox Chinese Horoscope Compatibility Rated 5 Hearts!